Who pioneered the scientific search for extraterrestrial intelligence? The American astronomer Frank Drake (1930–) is widely considered to be the first person to pursue the scientific search for extraterrestrial intelligence. Drake grew up in Chicago and earned his degrees at Cornell University and at Harvard University. In 1960 he conducted his first search for extraterrestrial intelligence by using radio telescopes—an endeavor called Project Ozma. He co-organized the first scientific conference on SETI, was instrumental in creating the SETI Institute, and was the first person to conceive what is now known as the Drake Equation. 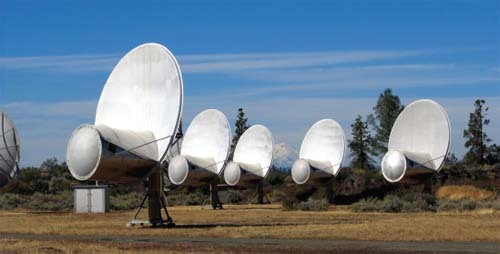 The Hat Creek Allen Telescope Array near Mount Shasta, California, is part of the Search for Extraterrestrial Intelligence (SETI) program.